Att.-Gen. requests investigation into suspension of Jasper Place Chief of Police Lawrence Kenney. Seated are W.F. Broadstock, Mayor J.M. Stone, Councillors William Nordon and Richard Butler. Automobile accident on the Edmonton-Calgary highway between Ellerslie and Nisku: Sgt. 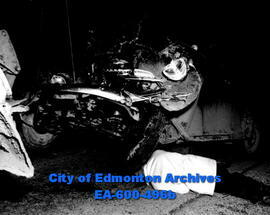 J. Muir of the RCMP and service garage worker examining the damaged car. Royal Canadian Mounted Police -- use RCMPRCMP (Royal Canadian Mounted Police)Muir, J.
Beverly Chief of Police, Const. N. West. Bobby Bond, age 13, is assisted by Constable F. Ashton, RCMP officer in charge of youth instruction at Edmonton's RCMP barracks. Boy Scout feature: Walter Olney on motorcycle with Const. Lloyd Munson. C.P. 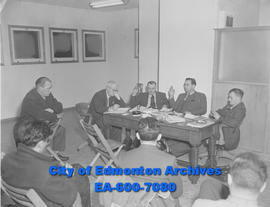 Curran (district attorney) and J. M. Jones (sheiff) of Mawston, Wisconsin, study the John Joseph Hoffman case, Edmonton. C.W. "Red" McNichol of City Police Force has been promoted to the rank of detective. This event was in honour of the Centennial anniversary of the Royal Canadian Mounted Police (RCMP). The N.W.M.P. Outpost is visible in the background.